Wow! Can it be true that season is coming to an end? I think this season has flown right by – but it was certainly a successful one! 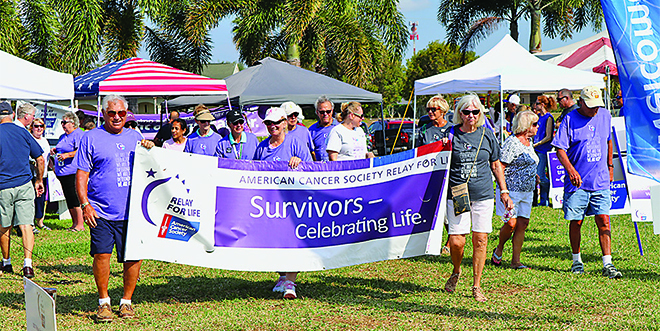 The Marco Island Relay For Life Event, presented by Robert J. Flugger, was held April 1st. It was the first time hosting the event at Veterans Community Park. The event this year was shortened to six hours, compared to twelve hours the previous year, which was a significant change that was made based on the needs of the community. The history behind the Relay For Life events dates back to 1985, when Dr. Gordon “Gordy” Klatt paced around a track for 24-hours straight to symbolize that cancer never sleeps. Since then, Relay For Life has traditionally been a 24-hour event. On Marco Island, and other Relays around the country, this model has since been adjusted to best fit their communities. For Marco Island, based on recommendations from the community and our committee, the decision was made to reduce the event to six hours, from 4 – 10 PM this year; and even with the time adjustment, we had an incredible evening. Fundraising for this event continues, as some teams have third-party fundraising events coming up post-relay. The overall success of Relay For Life is not without the countless teams, volunteers, and donors who have contributed to this event. From the bottom of our hearts, the staff of the Marco Island office would like to thank all participants and our sponsors, Robert J. Flugger (presenting sponsor), JW Marriott Marco Island, Truly Nolen and VITAS Healthcare; our in-kind sponsors, Coastal Breeze News, Condee Cooling & Electric, Marco Eagle, and New Life Community Church; our relay teams, Cancer Crushers, City of Hope, Fight Like A Girl, Flamingos, Hideaway Cancer Committee, Hilton Marco Island, Holy Walkamolies, Island Montessori, JW Marriott Marco Island, KW Realty, Lely Rotary Interact, Marco Island Toastmasters, Marco Island Women’s Club, Marriott’s Crystal Shores, Members Club at Marco, My Marco Properties, New Life Community Church, Marco Island Academy, Royal R & A Cleaners, Shoot Down Kids Cancer, Starbucks, Stonewalls, Team Belize, Team BMO, Team Janet and 7-11; and our survivor dinner sponsors who helped us put on a wonderful evening for over 100 survivors, Café De Marco, Capri Fish House, Chop 239, Ciao Bella, CJ’s on the Bay, Cocomo’s, DaVinci’s, Doreen’s Cup of Joe, Joey’s Pizza, La Tavola, Little Bar, Marco Prime, Ne Ne’s Kitchen, Pincher’s Crab Shack, Snook Inn, The Oyster Society, Verdi’s, and Wal-Mart. If you are interested in participating in the 2018 Relay For Life event, whether as a team, volunteer or donor, please contact Nikkie Sardelli at the Marco Island Office at 239-642-8800 or nikkie.sardelli@cancer.org. This event is run by a volunteer committee, and their commitment and efforts help make our Relay For Life event successful year after year.